On Wednesday 1st April Wine Travel Guides will be announcing a very special, unique, luxury wine tour opportunity in France. The announcement will appear here and will be linked to from the fabulous Dregs Report site. Do come back and take a look. I’ll be joining a very important group of wine bloggers in contributing to an April 1st day of wine fun – naturally, it’s wine and travel that will be the theme. Join us in putting the ridiculous back into wine touring. Check back on April 1st. LOL. 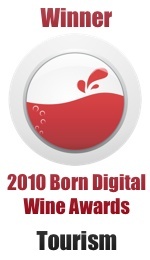 This entry was posted on Saturday, March 28th, 2009 at 3:18 pm and is filed under Wine Tourism General. You can follow any responses to this entry through the RSS 2.0 feed. Both comments and pings are currently closed.